The publication is in English and Hungarian. 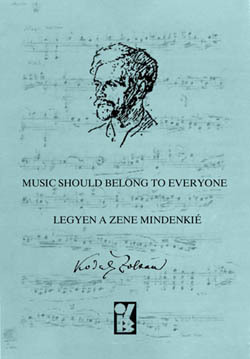 Did Zoltán Kodály write a book on methodology? Hungarian and foreign music educators have often asked this question. The answer is definitively no. However, in reading his writings, statements, forewords and epilogues to his reading-practicing exercises, we can get a clear picture of an explicitly outlined concept of w h a t, w h e n and h o w should be taught in order that music becomes accessible for everyone. - the adaptation of the concept in other countries. A short list of interesting exercises is added (in English) to the volume. Current full IKS members can buy it for USD 10.00.